The Giants were finally going to show everyone their offense on Monday night in Atlanta. Between their new-look offensive line, their healthy receivers, a Falcons defense which hadn’t allowed fewer than 29 points in the last four weeks and which has been the 31st-worst defense in the red zone this season, the Giants were going to put on an offensive display. And they did. They put on an offensive display of ineptitude. None of the other five losses this season were as bad as the Giants’ sixth loss to the Falcons. It was possibly the single-worst Giants game I ever watched. The loss to the Eagles had been bad considering it was a short week, the Giants’ season was on the line and the Eagles had to travel on the short week and still embarrassed the Giants, but this was even worse. The Giants had nearly 11 days from the end of the Eagles loss to kickoff on Monday night to plan for the Falcons, and their game plan produced three first-half points. The Giants were unable to get into the end zone against the second-worst red zone defense in the league until the game was nearly over. 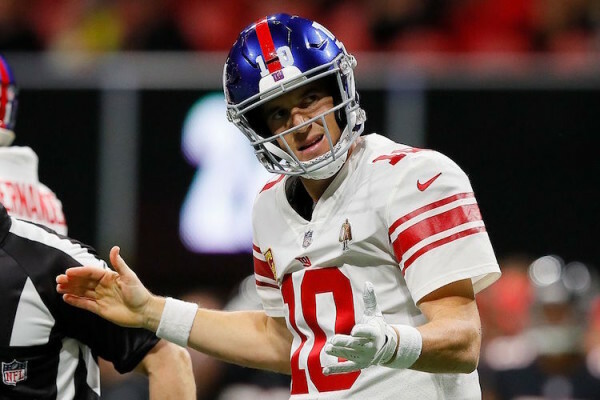 In typical Garbage-Time Giants fashion, the offense quickly put together two touchdowns near the end of the game to lose 23-20, tricking those who didn’t watch the game in full into thinking it was a close game, the same way they have done in prior losses this season. The new-look offensive line might have been the worst of the three we have seen this season as Eli Manning was sacked four times and pressured and hit so often it felt like five Ereck Flowers were blocking for him. Pat Shurmur, who is completely lost as a head coach, called unsuccessful play after unsuccessful play in the red zone, failed to score on fourth-and-1 on the goal line and then inexplicably went for a two-point conversion despite potentially making it a seven-point game with 4:47 left in the fourth quarter. Odell Beckham dropped the two-point play and after the game Shurmur defended his decision, citing a 50-percent increase in chances of winning had the play been successful and had the Giants scored another touchdown later. They did score another touchdown later, but it was only after the defense let the Falcons go down the field and only after yet another kicker drilled a miracle field goal against the Giants. Shurmur once again talked about “battling” in his press conference, as if this Giants team has battled at all this season. The offense doesn’t produce until the game is over and the defense can’t get a big stop or prevent any points from being put up when needed the most. He also mentioned how the team “isn’t going to do the math” but how they are instead going to “get ready for the Redskins” on Sunday. He might want to do the math. The math says the Giants are 1-6 and if winning 10 games gets you in the playoffs, which it doesn’t always, the Giants have to go 9-0 to reach the playoffs. Do the math, Shurmur. Your season is over. This season essentially ended when Graham Gano’s 63-yard field goal handed the Giants their fourth loss of the season, but the true optimists still believed. Most of those optimists gave up after the Giants were run out of their own building four days later by the Eagles. Now, if there’s anyone who still calls themselves a Giants fan, who believes this team has a 9-0 run in them, what are you doing? Go out. Call a friend. Date. Binge-watch a show. Pick up a new hobby. Do something that’s not sitting around thinking the Giants are going anywhere other than the top of the 2019 draft. The Giants are now 4-19 since the start of last season for a .174 winning percentage. If you thought the 2017 Giants were bad under Ben McAdoo, the 2018 Giants might actually be worse. Those Giants at least lost a few close games early in the season before injuries destroyed their depth and the team gave up. These Giants aren’t playing close games, have been mostly healthy all season and if they haven’t given up yet, it’s going to be scary to watch what it’s like once they finally have.